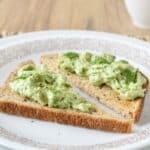 Today I’m sharing one of my favorite healthy breakfast ideas with you: Breakfast Guacamole on Toast. For this guacamole, avocados are pumped up with tang and protein from fat-free Greek yogurt (one of my favorite breakfast foods!). I’m also asking you to give me your own healthy breakfast ideas. Head down to the comment section of this post and help me start the day off healthier. Thanks in advance! I’m on a quest to discover the perfect healthy breakfast idea. Or rather, a bunch of perfect healthy breakfast ideas. Eating the same thing for breakfast everyday is as boring as waiting for a bus in the burbs, don’t you think? What I’m seeking (beyond variety) are breakfast foods with a blast of lean protein, a serving of vegetables (no fruit. My tongue can’t handle much sweetness in the morning) and a bit of whole grain. Why this combo? My body craves protein and grain in the morning. Without them, a grumbling loud enough to make my toddler giggle undulates from my belly and will not stop for hours (that the grumbles keep happening make her giggle all the more). The veg is because I never satisfy my vegetable requirements for the day and so I want to slam some into my morning. Other requirements for my breakfast foods: They must taste amazing and cannot take long to throw together. That’s not asking for too much, is it? 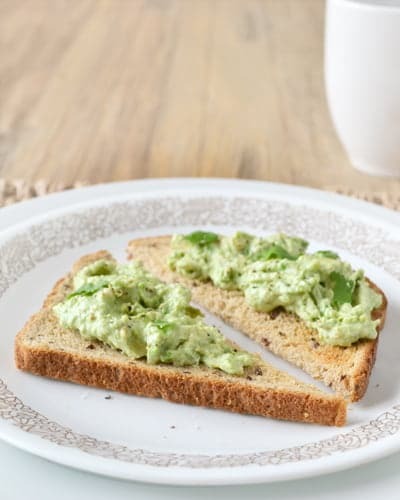 So far, my favorite healthy breakfast idea is this Breakfast Guacamole on Toast. 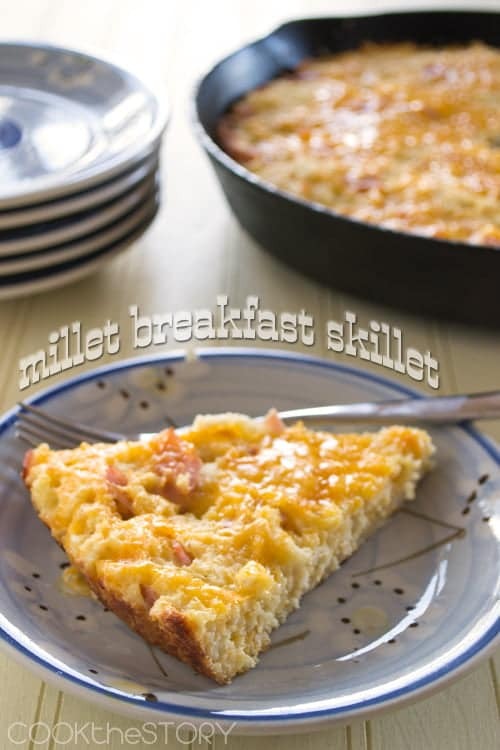 For more healthy breakfast ideas, be sure to also check out my recipe for healthy millet skillet. I hope you enjoy this healthy breakfast guacamole recipe! This healthy breakfast guacamole has non-fat Greek yogurt for a punch of protein and some tang. If you have extra time, do place some sliced radishes for on top of the guacamole for an extra blast of veg and of flavor. Put the bread in the toaster to toast. Scoop the flesh of the avocado into a small bowl. Mash it with a fork. Add the yogurt, lemon, a dash of salt and a grind of pepper and mash it all together. 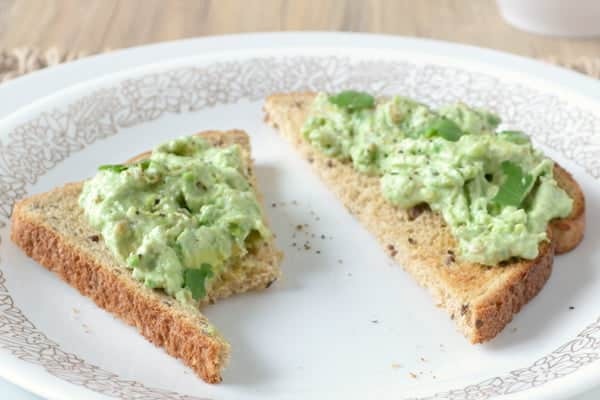 Once the toast has toasted, mound the guacamole onto the toast. Sprinkle the top with the second dash of salt and second grind of pepper. What I’d really love (and need!) are some great healthy breakfast ideas from you. Please help me fill my belly with breakfast foods that will power me up and shift me onto a healthy track. I can’t wait to read your healthy breakfast ideas in the comment area below. Feel free to provide links (only one per comment or my spam filter will kick in). Thank you! I have been enjoying this lately…..
Pile the eggs and tomatoes on top of the bed of spinach, sprinkle the cheese over it all. Pop it under the broiler to melt the cheese and voila a quick and yummy breakfast. The recipe is from Harley Pasternak’s latest book.